Glamour, entertainment, innovation; you name it and we conceptualize it. Our goal is to give every event a distinct vision. An identity that articulates true professionalism, taking us closer to an eloquent, purposeful & entertaining event. In our short stint of 10 years, from intimate to elaborate, we have designed, created and produced some of the most talked about events ever staged. Our expertise lies in working with our clients, embracing their marketing and communication strategies to carve a platform that conveys their key message and values in a diverse and impactful manner. Touted as one of the most reliable and creative event companies, we set new benchmarks with every achievement. 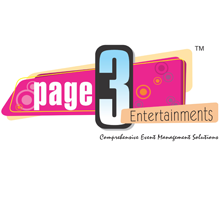 In-depth conceptualization, meticulous planning and time-bound execution are the three hallmarks of Page3 Entertainments.